EXCLUSIVE LOOK: Including the latest on one of the most sought-after Batman ’66 collectibles ever. For the complete FACTORY ENTERTAINMENT 1966 BATCAVE Index, featuring more coverage and photos: Click here. 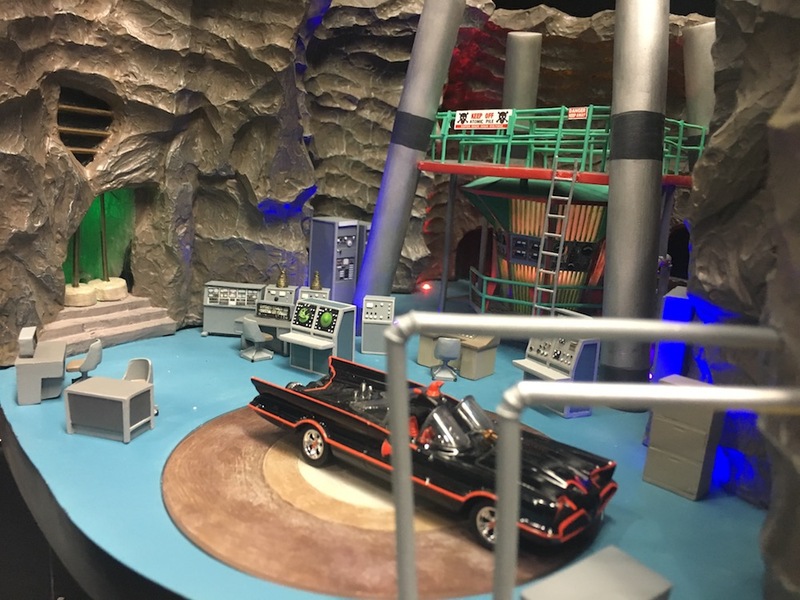 Factory Entertainment earlier this month began taking pre-orders for what appears destined to become one of the top Batman ’66 collectibles on the market — its hyper-detailed, 1:50-scale Batcave model. We’ve written quite a bit about it since last year — click here for much more coverage — but now we can show you exactly what’s gone into creating this remarkable sculpture. Now, a few months back, we helped Factory solicit some reader feedback about the piece. The big question was whether all the machinery would be stationary and lit or be moveable. Factory decided on a mix of the two (more on that down the line). There were also questions about the turntable and an accessory pack. (Click here.) Those are answered in our Q&A below. There’s also a way to get a reduced price: Get your hands on Factory’s San Diego Comic-Con exclusive Gotham City 14 Miles sign, which comes with a discount certificate. A limited number will be available to those not going to SDCC. Click here for more info. OK. Onward. As in: How did they create this thing to begin with? Dan Greenfield: How did this project come about? 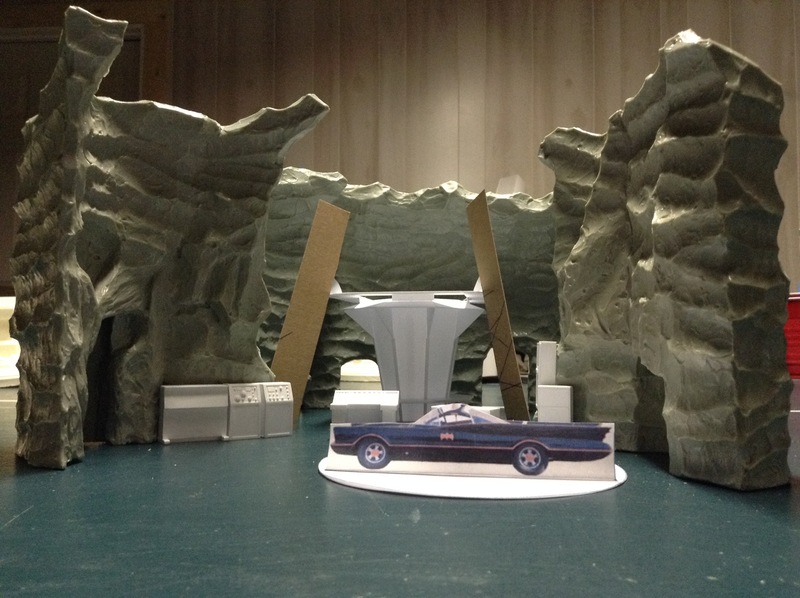 Barry Eldridge: As a child, I loved to replicate interior sets with cardboard and whatever I could find lying around for my action figures — yup, I was that kid! I would regularly fill my bedroom with cardboard-and-tape monstrosities that would drive my mother to despair as they began to collect dust and collapse. Structural integrity tended to be low on my priorities list. I even attempted a Batcave once, but let’s just say doing papier-mache indoors and using WAAAY too much water does not engender much parental support of creative outlets! 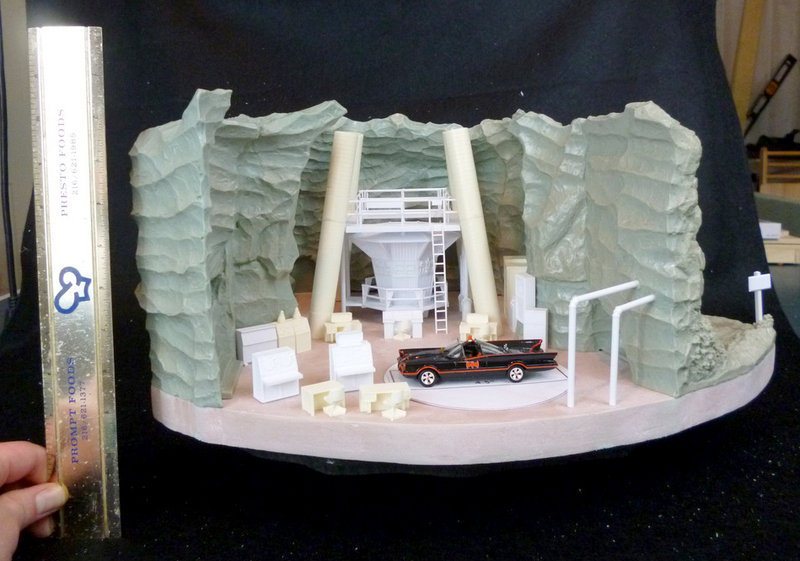 Many years later I was lucky enough to work on actual toy playsets. For commercial reasons, though, playsets tend to focus on play value, and “fun” features are typically added at the expense of detail, or size. When I began working in the collectibles arena, it was generally agreed that large, interior “replicas” were too toy-like and were not something people wanted, but it remained an area of interest to me. 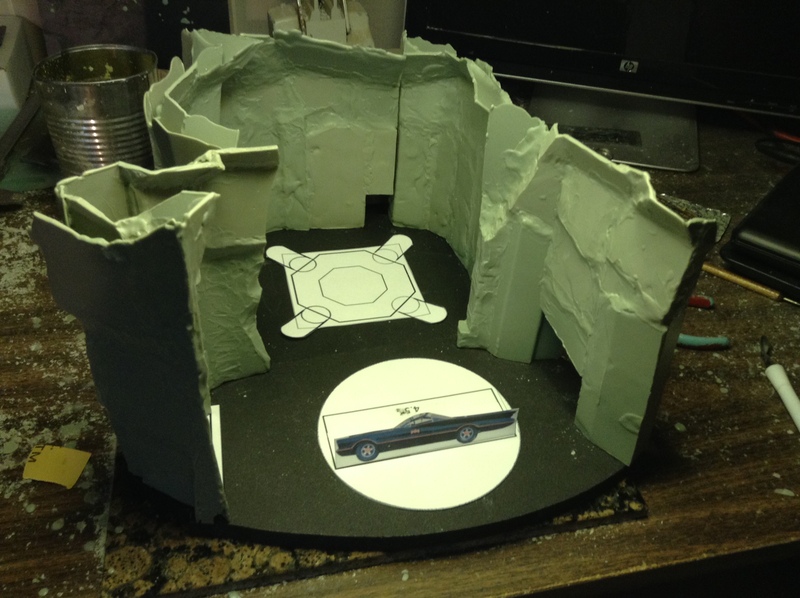 Several years ago, when Factory Entertainment obtained the Green Hornet license, we concepted a “Britt Reid’s garage” piece, complete with rotating Black Beauty turntable, as well as several Universal Monsters-themed pieces. But those projects never took off, mainly due to lack of commercial interest. However, we were able to successfully launch two highly detailed, scaled environments from our Game of Thrones line: They concentrated on exterior sets but they showed us there was a demand of like-products. We wanted to try some interiors, so internally we made a short-list of potentials from a whole raft of licenses that we felt would, and more importantly could, be reproduced. The Batcave was consistently at the top of those lists. The 1966 iteration of it is just one of those things that’s pretty much instantly recognizable to everybody anywhere and had never been accurately reproduced other than as very rudimentary toys. It seemed like a choice that had to be made. There is a high degree of skill required to recreate these things in miniature, a hybrid of architectural and artistic skill. The issue tends to be that in most cases sets are only shot from certain angles and often have a lot of missing and/or unfinished detail that is not required on screen, but is required to make a scaled copy in the real world. 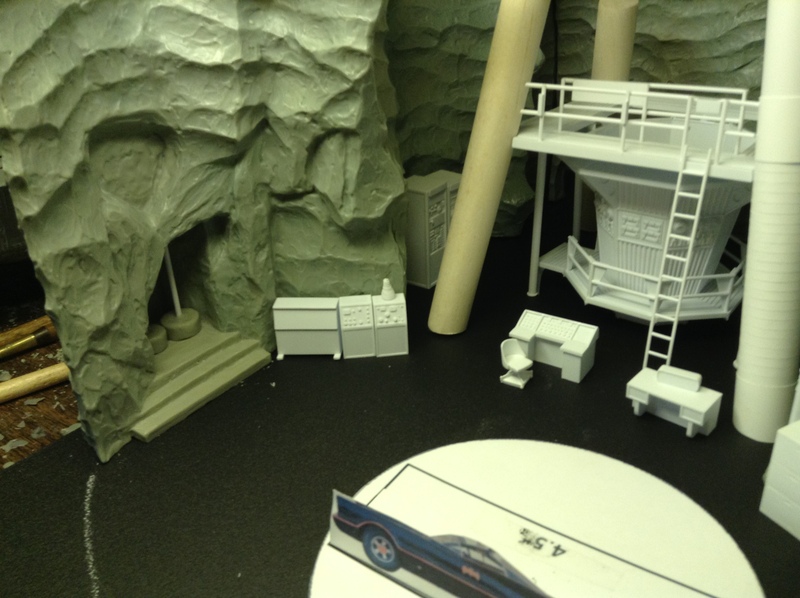 Having already worked with Kyle on several projects, we knew he was a master of the miniature and so was a natural choice to help bring the Batcave to life. Dan: Kyle, how did you get involved? Kyle Millard: Barry, who I have worked with on multiple projects, got in touch with me about the idea, and he asked if I was interested. It sounded like a neat idea and a good challenge, so of course I was interested. Oh, also it was Batman — how could I say no to that? Dan: Tell us how you were able to construct the prototype. Walk us through the process. Kyle: First, I found all the reference I could find, with Barry also supplying reference material. After studying it and deciding on the scale, I made a very simple floor plan, both to help me out later and to make sure Barry and Factory Entertainment were happy with the layout. Then it was the long process of actually making the thing. 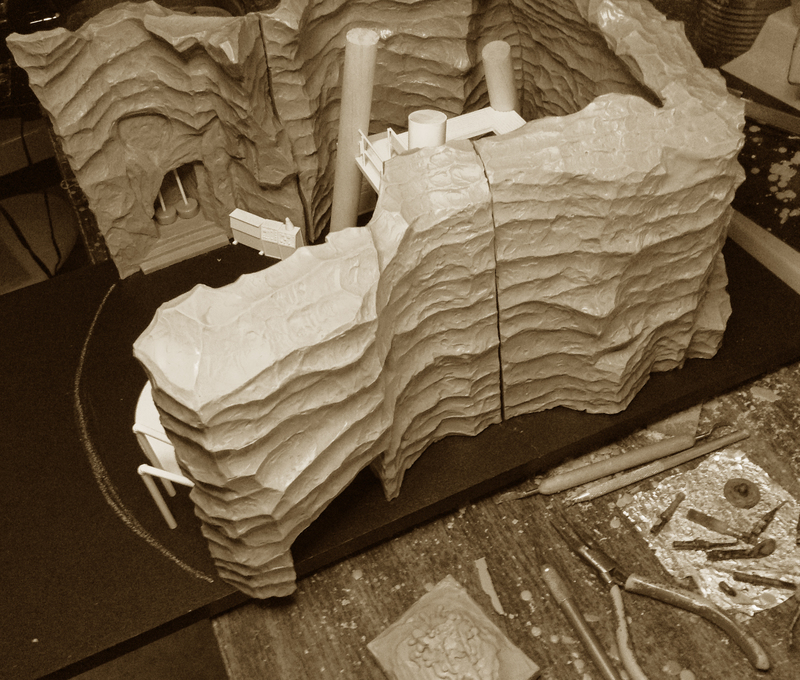 The cave walls were sculpted and the interior set decoration were models I made. During that whole process, I would keep in touch with Barry and get his input. Once we were both happy with it, images were sent to DC for sculpt approval. Once we had that, the dreaded mold-making process began. Without boring everyone too much, I created molds for every piece, cast everything and painted it, and again, sent in images for paint approval. Dan: What kind of materials did you use and what’s being used for the final version? 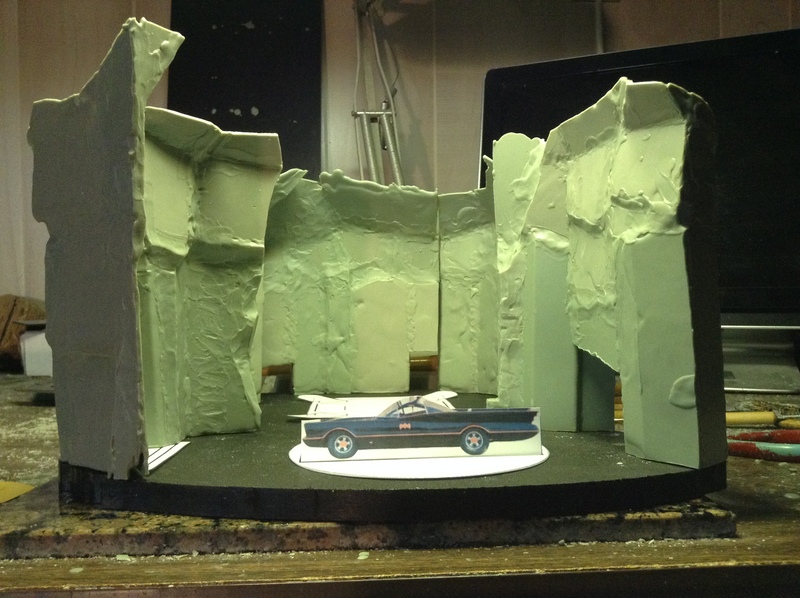 Kyle: For sculpting the cave walls, I used a hard sculpting wax and for all of the interior pieces. 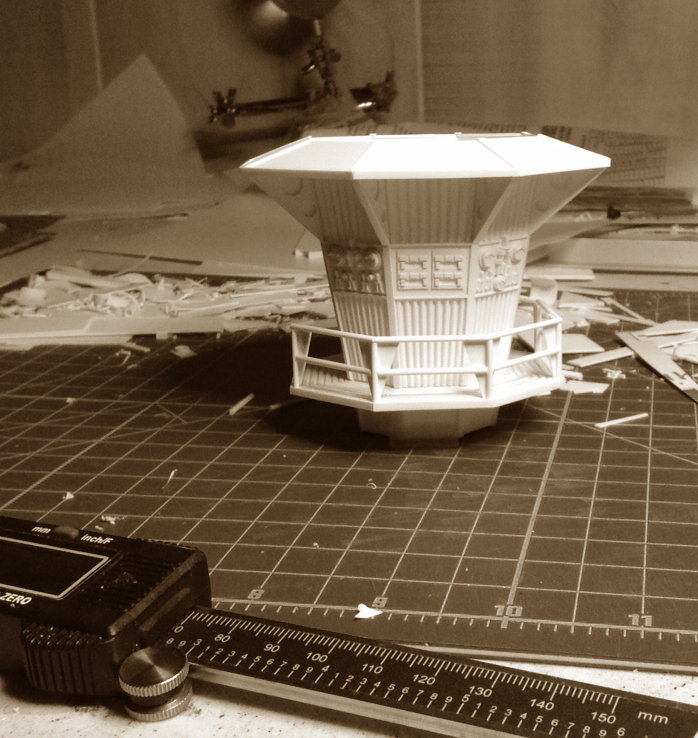 I used styrene to build all of the little model pieces. 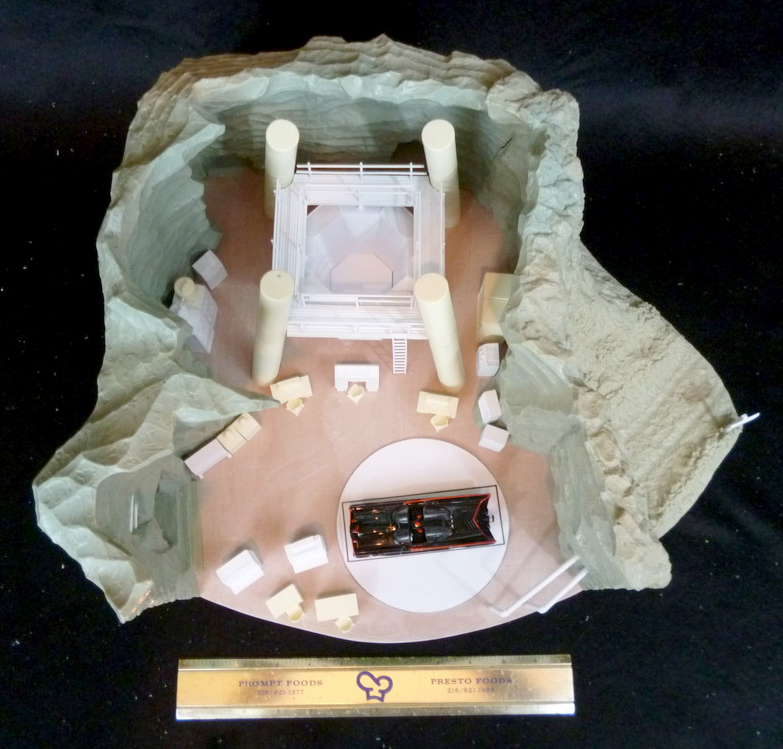 One of the things about this project that I was really excited about is that for the first time with a professional piece, I could try my hand at model making. 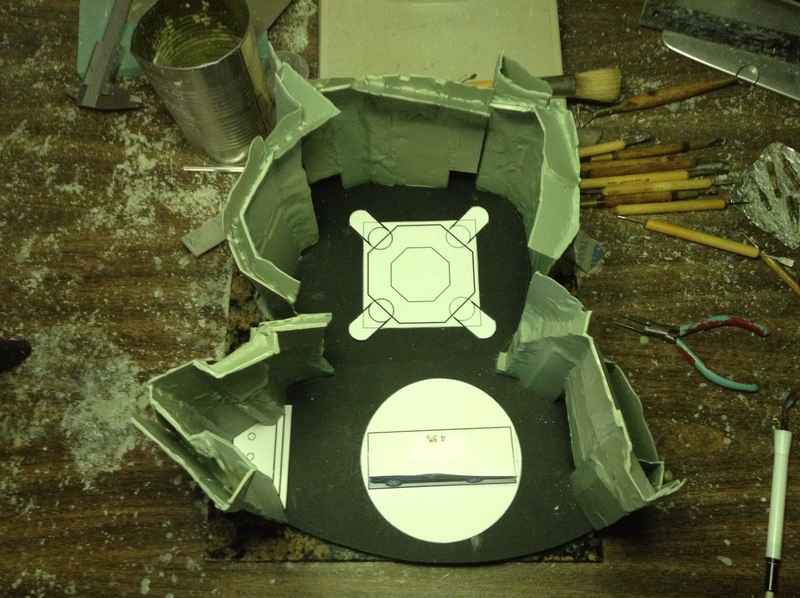 I had used styrene a little before, but with the amount that this project required, I really learned a lot. Also, I cast the prototype in urethane resin. Barry: The final piece is mostly constructed in polyresin with PVC and plastic used for smaller components and items that move. Dan: What reference material did you use? Kyle: Pretty much everything I could find on the internet, even artwork. Most of the higher-res stuff (very important for details) came from Barry, also the show itself. It was always easier to get a sense of scale and distance when there would be a nice panning shot over looking at a still image. Barry: The Blu-ray discs were a gift from the gods! Without them, we would have had a much harder time. 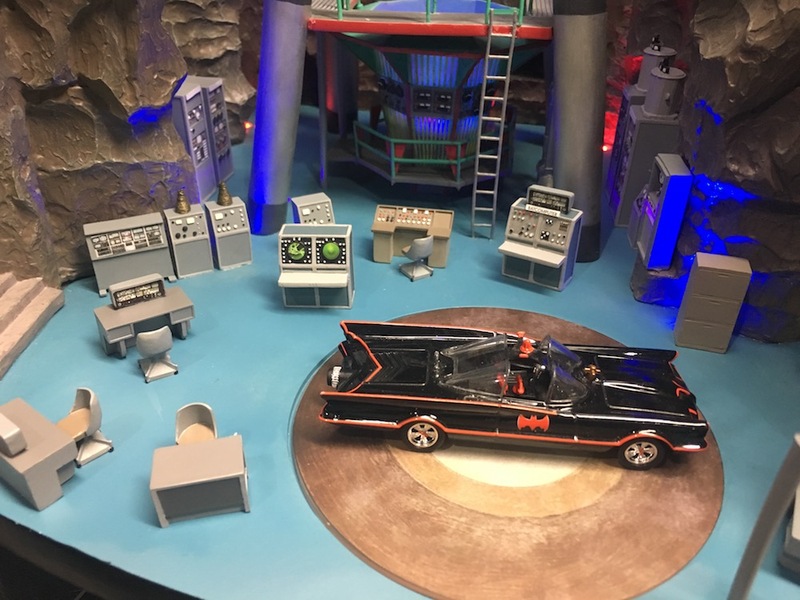 They allowed us to screen-capture any detail we needed and cross reference the numerous changes and iterations that the Batcave went through during its on-screen service. Of course, the Warner Bros. archive was also invaluable… but try as we might, and we spent almost a year working on the research for this piece, we could not track down any of the original production blueprints that were used to create the original sets. They are out there, somewhere, and we did manage to get a look at some copies, but the location of the originals was tantalizingly beyond our investigative powers. Dan: I know Barry is, but Kyle, are you a big Batman ’66 fan? Kyle: Actually, my introduction to Batman was the ’89 film. I was probably around 7 when I first saw it on VHS. While I had known about the ’66 show, and had seen images from it, it wasn’t until much later that I actually saw an episode. Dan: What are your favorite episodes? Kyle: It wasn’t until this project started that I really watched a bunch of the show. Sadly though, I was pretty laser-focused on the Batcave parts, looking for details and layout, so I can’t really answer that! So instead, how about my Top Four Batman movies (laughs): 1. The Dark Knight. 2. Batman (1989). 3. Batman Begins. 4. The Dark Knight Rises. Barry: Kyle and I agree on a lot of the classics, but is it wrong to admit that I was far more drawn to the villains than the Dynamic Duo? Any episode with a cool villain is good for me, but I particularly liked Egghead, and Vincent Price as an actor opened my eyes to a wider world of film. Alfred was also brilliant, and when he dueled with the Joker in Flop Goes the Joker, I immediately wanted to take up fencing! Dan: Where do things stand on an accessories pack? Barry: That’s is something we would like to look at once the product is in the marketplace and selling. That way we can see what the demand and likely audience is and we can get the licensing side of things squared away. Dan: What are you disappointed that you could not include? Barry: Oh, this is so hard! These products are our babies and nobody likes to think about their babies with disappointment, which I don’t! For me, I think what we have delivered is as close to perfect as you can get for the price point. I will say that we did experiment with an electrically operated turntable. Looked great and was, fun to use for 5 minutes… but inertia was not our friend and any model placed on the turntable would eventually move outward and spin off, even at slow speeds, resulting in a Bat-tastrophy for display. Curse you, Sir Newton and your laws of motion! We did think about including little wheel chocks, but they would have been infuriating to place correctly. And, after all, the manual motion is much more screen-accurate: Moving the actual Batmobile was 100 percent a manual process. There were no labor-saving electric turntables to be seen on the real set! I would also love to have included a little Alfred, with a feather duster. After all, he kept the place spotless. But, sadly, at this time the dusting will need to be 100 percent owner operated. Dan: What are the chances we could get a Wayne Manor study to go with this? Barry: If this piece does well commercially, we will certainly look at other add-ons and additional pieces, and not just from the Batman universe. This was great fun to work on and the realization of a childhood dream, so we look forward to doing more!